Our first WNC CRAFT tour of the season started off with a bang! 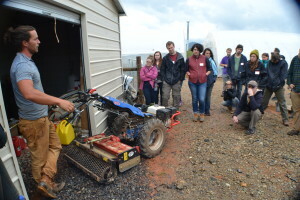 Although the weather played some tricks on us (not knowing whether to rain or shine) we carried on and learned so much about market gardening with a walk behind tractor and hand tools at Second Spring Market Garden. 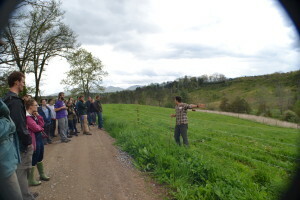 Matt Coffay and Casara Logan are the earnest, hard working farmers behind Second Spring and they were joined by Chris Link the Farm and Food Program Associate who is managing the Southern Appalachian Highlands Conservancy (SAHC) Community & Incubator Farm where Second Spring is leasing land. Chris started us off with an overview of the 103 acre Incubator farm that was donated to SAHC in 2010 by the Anderson family. 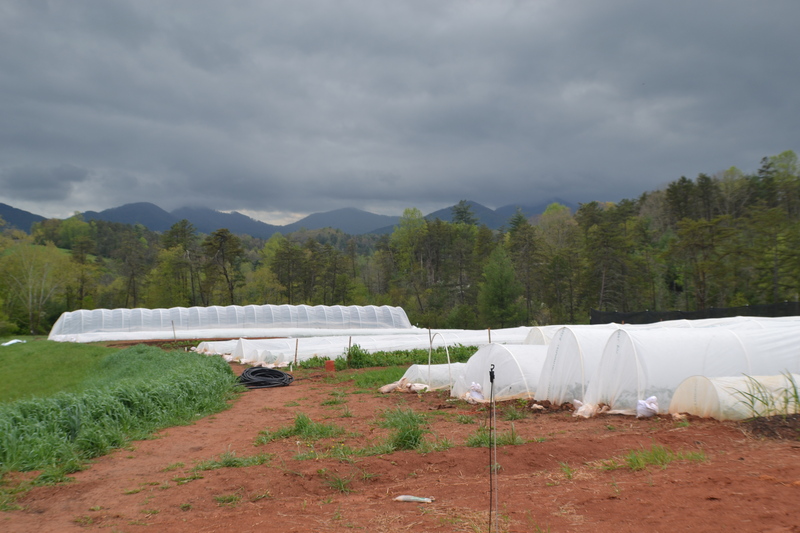 The Conservancy has been working tirelessly since to rehab the farm and make it usable for up and coming farmers that are finding it hard to access land in WNC. 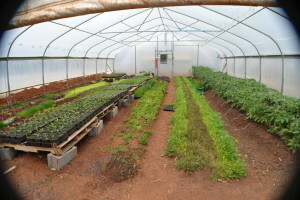 The purpose of the Incubator is to provide new or beginning farmers with access to land and equipment at reduced rates to help initiate new farm businesses. The first major project SAHC took on was a stream bank restoration project completed with the Army Corp of Engineers. They set aside 150 ft of land on either side of the stream that runs through the property creating a 300 ft buffer to protect the waterway. As a result SAHC can then sell conservation credits they earned through the project as a way to help cover some of the farm’s overhead costs. The incubator started accepting applicants in 2014 and Second Spring Market Garden was their first incubatee! Gina Raicovich came on board not long after and is leasing land to graze her herd of Pineywoods cattle, a rare heritage breed. There are still openings on the farm especially for a farmer looking to run a honeybee apiary or small livestock like goat, sheep or poultry. After walking around the Incubator farm with Chris, Matt and Casara took the reins. When they came to the Incubator farm they transitioned from farming on a quarter acre of land to 1.5 acres – a big jump in scale! 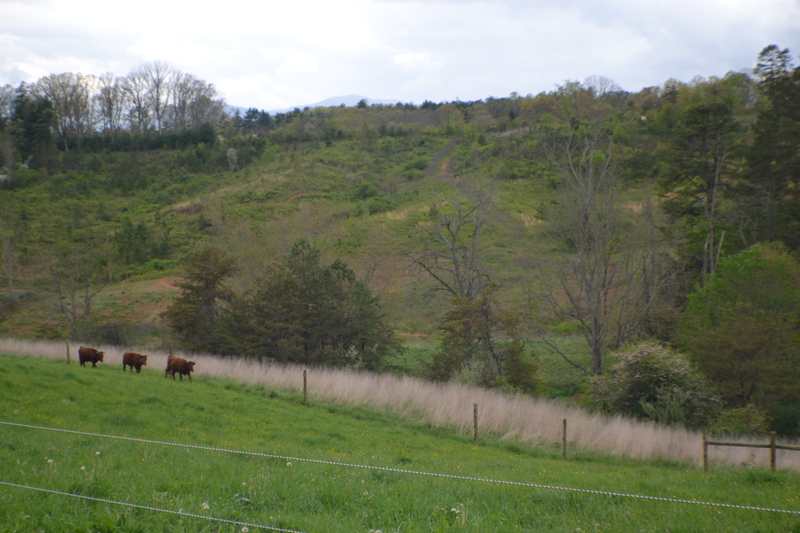 This spring they faced a steep learning curve with not only producing more, but also learning their new piece of land. But, they’ve taken it in stride and made investments in planning, tools and soil building now that will pay off as the years go on. Matt and Casara were drawn to farming while living and studying in Nanjing, China. 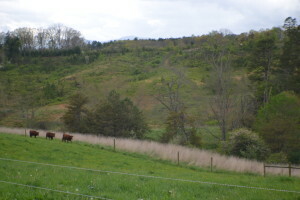 After seeing the human impact on the land there, they started considering what sort of impact they wanted to have in the world, and became inspired by Eliot Coleman’s The New Organic Grower. Not long after they met Jean Martin Fortier a farmer in Quebec and author of the The Market Gardener who was taking Coleman’s small scale strategies, marrying them with careful whole farm planning and making a living. Matt and Casara have borrowed heavily from Fortier & Coleman’s teachings and are aiming to be the first 52 week CSA in the Asheville area. In addition to their 45 member CSA, they market their produce at the French Broad Co-Op tailgate market, and City Market. The workhorse at Second Spring is their BCS 853 walk behind tractor. Walk-behind tractors are popular farm tools in Europe where small scale farms are more prevalent and have the advantages of mobility (don’t need large turnaround space), wide range of multi-purpose soil cultivating implements, and a lower price tag than a full riding tractor. Casara, “the champion bed builder,” built all 128 of their 2.5×100 ft raised beds with the BCS. After that initial work, they use the BCS for about 10% of their work each week. Following, some grading on the land, Matt and Casara were faced with compacted clay soil, so the BCS came in handy as they worked in 2 inches of compost across all their beds, and for adding another ½ inch right before planting with their power harrow implement by Rinaldi. 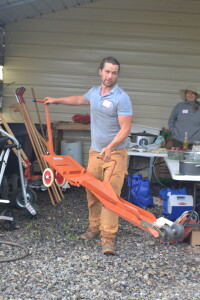 A few other tools they find handy are a broadfork, wheel hoe, scuffle hoes, 6-row precision seeder for salad mix, and a paper pot transplanter. People had lots of questions about the paper pot transplanter in particular. Matt explained that it was originally created for sugar beet planting in Japan. And, they can fit 4-5 rows of plants in one of their 30 in beds. Small Farm Works is a state-side supplier. The time-saved planting is well worth the additional price for the specialized supplies. In order to fulfill their 52 week CSA plan Second Spring market garden relies heavily on various season extension methods year round. 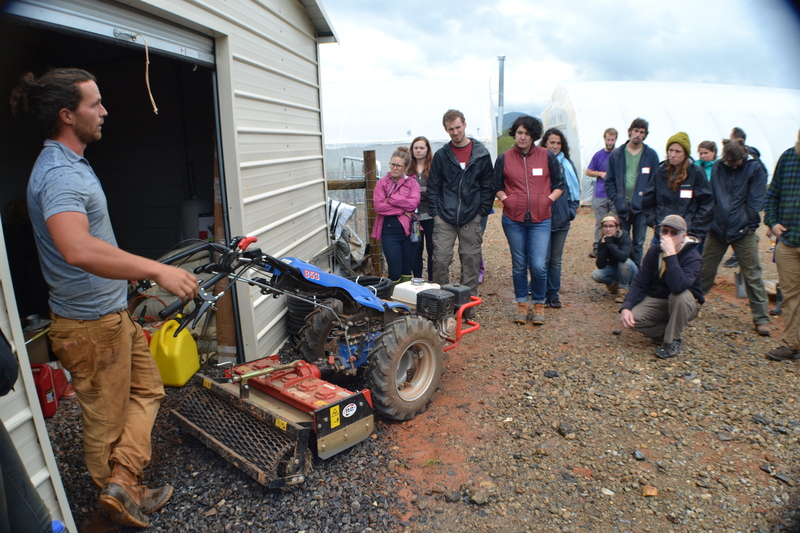 For winter production, Matt explained that there are two tiers to their planting – overwintering and early seeding. Overwintered produce is planted in the fall but won’t be harvested until early spring. That includes things like carrots, spinach, green onions and the like. The second tier are planted early in the fall and allowed to grow to maturity, protected under a combination of Agribon low tunnels and caterpillar tunnels in the field, and then harvested as needed throughout the winter. 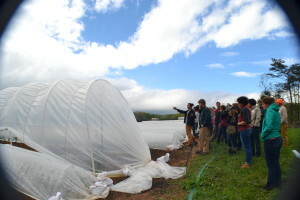 Caterpillar tunnels are a cheap alternative ($600) to more permanent high tunnels, but they are high maintenance because they must be opened and closed manually each day to regulate temperature. Even in the summer, they will keep many of their crops under row cover, using Agribon 15 which functions more as protection from pests than temperature. 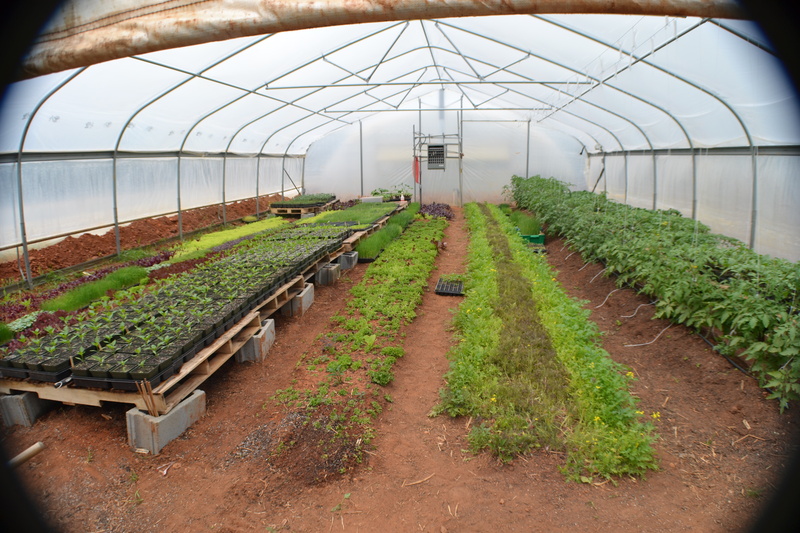 They also employ two greenhouses where the most tender of plants are kept in the winter, like salad mix, and where they start their spring and summer transplants. In the winter greenhouses are heated with propane and kept at just above freezing at night. Matt suggests using the ACF Greenhouse calculator to get a close estimate of your propane expenses each month. In the summer they will be filled with tomatoes. 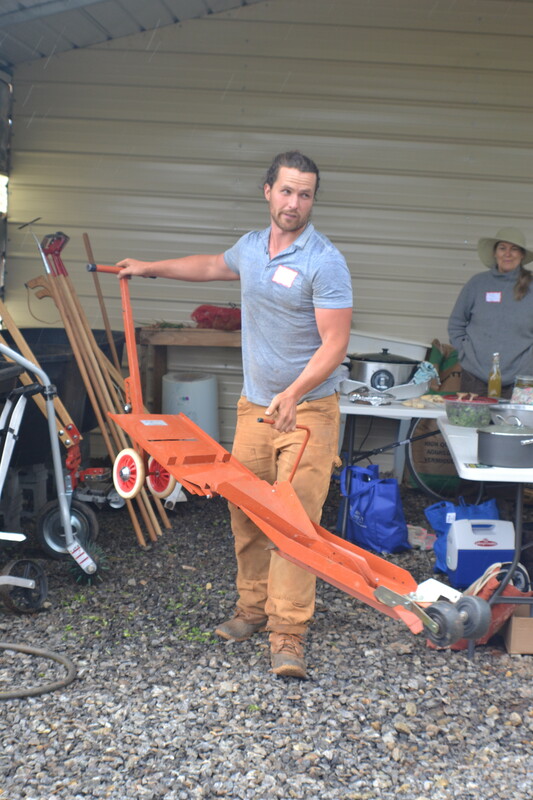 In addition, to the land access support Second Spring market garden is accessing through SAHC, Matt & Casara applied for and were awarded a Micro Loan from the USDA to help cover their start-up costs and purchase needed equipment. Our deep thanks goes to Matt & Casara of Second Spring Farm, and Chris with the SAHC Incubator Farm for hosting our first WNC CRAFT tour of the year. We started off on a good foot! Hope to see you there next time! Now is the time to join CRAFT for 2015! CRAFT is a year-round farmer training collaborative that offers farmers, farm workers and aspiring farmers networking and learning opportunities. For more information or to join, click here. 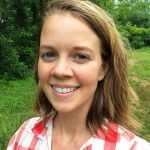 Or contact Cameron Farlow, Organic Growers School Farmer Programs Coordinator at 828.338.9465 or cameron@organicgrowersschool.org.